India and Bangladesh breathed a sigh of relief last month after China denied it had plans to divert waters of Brahmaputra River to its arid region. At a press conference in Beijing on October 12, the Chinese Vice-Minister of Water Resources Jiao Yong said such a project on Yarlung Zangbo River, as it is known in Tibet where its headwaters is, would affect relations with downstream countries. This statement came with an admission that the project is neither technically feasible nor environmentally sound. But Beijing has not given up on its plans for the Brahmaputra. Since the 1990s India has been wary of China’s plans to divert the Brahmaputra to its drought-prone north-western region. Several Chinese hydropower lobbyists had been calling for greater use of the river. The Brahmaputra courses 1,700 km through the Himalayan roof of the world before entering India at Arunachal Pradesh. Tensions had heightened with the publication of Tibet’s Waters Will Save China in 2005, which detailed routes of the water diversion project through undulating highlands. The book was written by well-known Chinese hydrologist Guo Kai in consultation with the country’s water resources ministry. Critics, both inside and outside the government, had cautioned that the project would cause irreparable damage to a unique and fragile ecosystem. China’s former water resources minister Wang Shucheng had termed it as building castles in the sky. Soon after Jiao’s announcement, India’s External Affairs Minister S M Krishna said the clarification on the long-standing row had come as a relief. But the clarification seems to be just an eyewash. While Beijing has shelved the diversion project, it has begun damming the upper reaches of the river, with a series of six hydropower projects. Together, they have a potential of generating 60,000 MW, around one-third of India’s total installed capacity. Construction is under way on one dam that will be operational by 2014, while the rest are in different stages of planning and proposal. All of them are run-of-the river type where water is diverted to a lower point to generate electricity and later allowed to re-enter the river. The most ambitious of these projects is the one proposed at Metog, close to the Indian border and on the Great Bend of the Brahmaputra. Here the river plunges from the roof of the world, curling down towards the plains of India and Bangladesh. The idea is to build a 50-metre-high dam at an altitude of 3,000 metres and harness the river energy as it falls 2,000 metres—at a rate of 15 metres per kilometer—along the world’s longest and steepest canyon. As a child he was never allowed to go near the Yangtze. His parents feared the river’s strong currents might sweep him away. 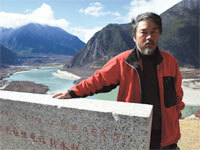 But there was no stopping Yang Yong’s passion for rivers. In his late 20s, Yang rafted the entire length of the Yangtze, from its headwaters in Tibet to the end destination in Shanghai. During the 187-day drafting expedition, he documented the river’s hydrology and made observations of the glaciers that feed it. The rapids in the upper reaches of the Yangtze had claimed lives of 10 of his companions. About a decade later, Yang made another trip to Tibet. This time to the headwaters of Yarlung Zangbo, the Tibetan stretch of the Brahmaputra. Along with his companions, Yang hiked 400 km till Mount Kailash—several dropped out, fearing the longest and steepest gorge in the world—and rafted 1,800 km stretch of the gushing and meandering river. Today, at 52, this river traveller and geologist heads a non-profit Henduanshan. He revisited the river last year to study the effects of climate change on its hydrology and to assess the government’s controversial hydro power project proposals. He found tell tale signs that may have long-term implications on Himalayan rivers. Earlier the snowline was at an altitude of 5,000-5,300 metres; last year it was at an elevation of 5,500 metres. The glaciers have receded 200-500 m in the past decade. The grasslands in the upper reaches have also degraded, showing a trend of desertification. Often referred to as one-man army, Yang calls for more homework on safety and environmental impacts of development projects in Himalayan river basins. Hydro-engineers estimate this could generate 49,000 MW—more than twice the capacity of Three Gorges dam, the world’s largest power station. 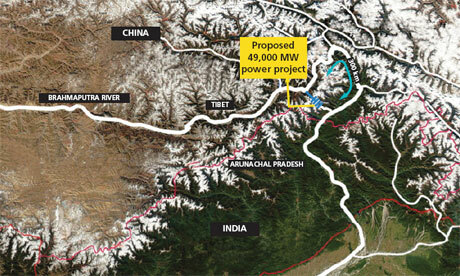 To tap electricity, Brahmaputra water will be diverted into a 20-km tunnel dug through the mountains across the bend. After driving turbines at nine different falls along the channel, water will be released into a tributary, which joins the Brahmaputra after a 300 km stretch around the Great Bend. The river takes a sharp turn from the Himalayan range into India at this confluence (see map). China says the dams will not affect downstream areas as run-of-the river technology is non-consumptive; the only loss of water is through evaporation and percolation en-route. Unlike the conventional hydel power project, run-of-the river project also does not require large dams and reservoirs and hence, deemed harmless. During his visit to Beijing in May last year, former environment minister Jairam Ramesh had told a conference that the projects would have little impact downstream. Scientists do not agree. The projects are in a seismically active and ecologically fragile region. The area around Metog is particularly highly unstable, says Yang Yong, an independent Chinese scientist who has travelled up to the headwaters of the Brahmaputra in Mount Kailash and trekked the region (see ‘Yang Yong: the river voyager’). The Indian and Eurasian tectonic plates keep colliding beneath the Tibetan plateau and there is a lingering fear of earthquakes, rock falls and mud flow. This could put at risk the downstream population, both in Tibet and India, Yang says, adding that a landslide in Tibet in 2000 caused “the largest geological disaster of its kind in the world”. The landslide created a 3 km-wide, 90 m-high wall of mud and rocks on the Brahmaputra, 300 km upstream of the Indian border. Within three months, a lake called Egong was formed on the throttled river. The Chinese government planned to drill through the wall to release water and evacuated 7,000 people in low-lying areas. But the wall collapsed, leading to a massive flood that killed hundreds of people in Tibet and inundated five districts of Arunachal Pradesh and parts of Assam. Over the years, siltation in the river has increased because of rise in the sediment yield in the Himalayan range, says Partha K Das, head of the water, climate and hazard programme at Aaranyak, a non-profit in north-eastern India. Though there is no data on siltation, it is highly visible. The water carrying capacities of the channels have reduced, resulting in frequent floods. This could have detrimental effect on the projects, says Das, calling for more work on their safety and environmental impacts. While there is some concern, India is not openly objecting to China’s plans to dam the upper Brahmaputra. Rather, Prime Minister Manmohan Singh recently relayed the message that he had been assured at the highest level that the Chinese are doing nothing detrimental to interest of the country. Perhaps, the government is ignoring China’s plans because India is constructing similar projects in the Indus basin, which it shares with Pakistan, and plans to construct 70 large dams on major tributaries of the Brahmaputra before it enters Bangladesh. Is there an international authority to hear and judge inter nations disputes relating to the use of environmental facilities? For example as in the case above ie, dam construction across a river which flows between two nations? As far as I'm aware, there is no such authority, only treaties, multi-lateral/bi-lateral in nature (the Indus Water Treaty of 1960 is one case in point). An aggrieved party or riparian state can and has in the past approached the International Court of Justice. However this would require consent of all parties.